Stones In the Field: Spring! So, I almost put the windows back in . . . But this really should be winter's last gasp. I brought 'em with me just in case. i want your jeep. i love jeeps. I hate to tell you this, Mac, but it looks like the fire department went a bit nuts with the fire extinguishers. 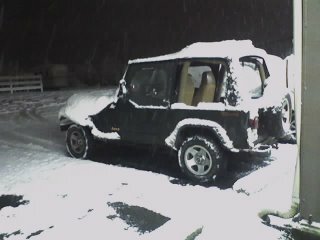 Ah, the snow won't do the jeep any harm - until it melts. Nope, not anyone's gonna convince me to move any further north than I am now nor to any elevation at, or south of, this latitude that's above the snow line. nope. nope. nope. McAllister, I'd like to know why you run your forum like a division of the SS? It only snowed once here...Do the windows in the jeep ever go up? By the time it seems like a good idea, you don't need em anymore, it's May. ;) Still comin down next weekend? Yep, I'll be there, kiddo. :D Shall I take you grocery shopping? I suppose at this point, Mac, putting the windows in, would be...useless. Spring's almost here, right. I believe you've had more snow than we have. Which is very strange. Seeing as I just ran out of coffee this morning (NOOOOOOOO).... :) If I can ever get a hold of my mom, she's supposed to take me out this week....Although the weather is so nice here, she's probably permanently stuck to a horse. 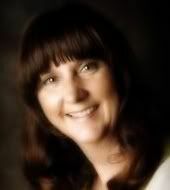 all of my snow has finally melted...ahhhh..missouri weather is so wonderful...i can't wait till spring. It is my favorite time of year. To see everything come back to life. It is inspirational really. It teaches us that no matter how harsh the winter(life) we can and will survive and flourish. Your blog is wonderful. I will be back again. It certainly looks like winter is losing the power in it's punch. Spring can never come too soon. Here in WV we got a humongous amount of snow and ice, so I can only imagine what you went through. I agree with dawn- there's no way I'm going any further north. Ever. If you run this place as well as you drive your Jeep, we're in for a real treat!